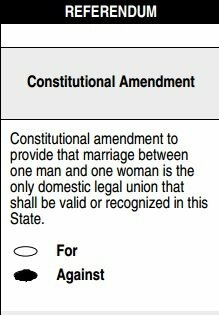 At its annual meeting on Saturday afternoon, March 31, AAUW of North Carolina debated and passed a resolution against the Amendment One that will be on the North Carolina primary ballot on May 8. The image to the left shows how the amendment will appear on all four primary ballots: Democrat, Libertarian, Republican and Non-partisan. Be sure that your friends who have registered to vote as unaffiliated with any party know that they, too, have a vote in this primary (and that, indeed, they can choose a party ballot if they wish). Absentee voting has already begun. Be sure you are prepared to help voters understand both the primary voting process (since many skip the primaries) and this issue. Edited 4/14 to add Democracy NC flyer. PreviousPrevious post:2012 Minutes for Annual Meeting and Board Meeting are PostedNextNext post:Where will you be on April 28 2012?